Pendeen is situated on Cornwall’s Penwith peninsula, seven miles west of Penzance. A remote village famous for the nearby Geevor Tin Mine, Pendeen has a strong sense of community with various local groups that have been running for a number of years. 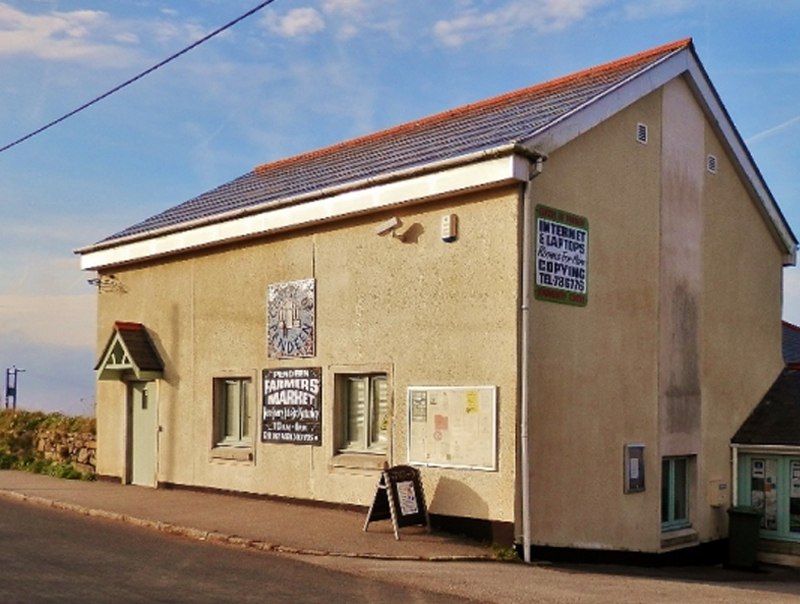 Many of these groups are hosted at The Centre of Pendeen, a volunteer-run community venue in the heart of the village. The origins of The Centre date back to 1931 when the former, much smaller, Pendeen Parish Men’s Institute occupied the same site. As the Institute became underused and in need of repair in the mid 1990s, plans were drawn up and funding secured from a number of sources to demolish it and build a new centre for all residents of Pendeen to enjoy. The new build incorporated the integration of renewable energy technologies including a Ground Source Heat Pump and Photovoltaic (PV) panels to generate the electricity to drive the pump. The rebuilt community building now provides a vibrant base for activities such as t’ai chi, pilates, yoga, table tennis, short mat bowls, chess, scrabble, a patchwork group, a gardening club and Pendeen WI. A farmer’s market is held there twice a month. In addition, The Centre houses top quality snooker and pool facilities. Now The Centre has introduced a new opportunity to local residents to use the Centre’s superfast broadband connection to learn basic IT skills. In 2015, Superfast Cornwall supported the Get IT Together Cornwall project, which teamed up with Cornwall Rural Community Council (CRCC) to provide training at the venue, which was attended by over 20 members of the local population over a course of 7 weeks. The project also aimed to show people aged over 55 how they can save money on household energy bills by using online comparison sites. Sandra Coak, volunteer and member of The Centre’s committee, was instrumental in organising this beginner’s IT training and since then, she has continued to drive the promotion of IT to local residents. In 2019, three state of the art laptops have been loaned to the Centre by Superfast Cornwall. This new addition enables the centre to provide fresh services and support to Pendeen residents including the new Pendeen Online project. The Pendeen Online Project offers free access to computers on weekdays for as long as they need to any residents who are on Universal Credit or other benefits or on low incomes. So far, over twenty local residents are registered on the Project and that number is expected to continue to build especially if the government rolls out Universal Credit for all claimants in Cornwall. With two volunteers trained as Digital Champions, The Centre offers a free weekly drop in service to anyone who would like IT training support or help with a technical issue. Sandra says: “We will also support anyone who would like help with benefits applications or indeed any other area where they are being held back through lack of access to the internet or lack of IT skills. This can include help with job applications and CVs as well as registering for Government services. The three new laptops are making a big difference to the quality of service we can provide. Sandra adds: “The Pendeen Online Project was originally conceived to help people make applications for Universal Credit. However, we are now also broadening this out and we are looking at a number of further initiatives which will make full use of superfast broadband and the laptops on loan from Superfast Cornwall. “For example, in February 2019 we held an event in association with University of Plymouth, that introduced local residents to the potential of new technologies, including virtual reality. This was attended by 150 people, far more than we anticipated, and indicates the demand for learning about new opportunities. “In Autumn 2019, we will be running a series of six pop up events, focussing on what steps local people can take to help mitigate climate change, covering a wide range of sustainability topics, including eCars. “In association with the Arts Council and Trinity College London, we are also launching art classes for children. Another possibility, for the future, is planning a homework club as not all children in Pendeen have access to the internet at home.